Able to carry 175 lbs. Available Storge and Carrying Bag to protect your cart! Navigate your way with ease when using the Remin Kart-a-Bag Concorde III . 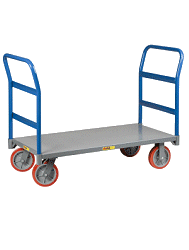 Features include a push-button locking system, tubular polycarbonate handle, 6" roller bearing semi-pneumatic wheels, chrome plated solid steel wheel guards, sliding base lock and wire curb/stair slids. An adjustable lock on permanently attached elastic cords prevents load shifting. Weight capacity: 175 lbs. Meets most carry-on under-seat storage restrictions. Dimensions: 41 x 9.5 x 11.75"; Storage Dimensions: 18.75 x 13 x 4.5"
This is my third Concord folding cart, this one slightly smaller than my last one. They last about 4 or 5 years with frquent use, and then usually the folding mechanism gives out. But they fold small enough to fit under the seat in front of you on an airplane and carry a bunch of weight, I often load mine with over 100 lbs. Most other carts are either too big or don't last. 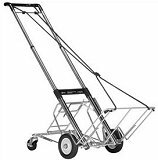 This cart is the favorite for my technicians who are constantly transporting materials throughout NYC on sidewalks, streets, upstairs, etc. This cart has held up better than any other cart we previously used. This is an excellent product and I am very satisfied with its performance. This is the 2nd folding cart I have purchased, the 1st lasted almost 20 years it had a 12 year warranty and it would have lasted longer but was starting to look a little weathered. I was actually going to throw it away and one of my clients asked if he could have it so it will live on and be of service to someone else. I use the cart several times per day every day and expect the same service from the new one. Simply the Best Cart in the World. This product is fantastic. I love it. I USED IT LAST WEEK ON A VIDEO SHOOT. WORKS GREAT, VERY FLEXIBLE AND I LIKE TO LIGHT WEIGHT TOO. STURDY AND WELL BUILD. USE IT TO HAUL MY LARGE CAMERA BAG, TRIPOD, ALUM SUITCASE WITH LIGHTS IN IT, AND BOX WITH OTHER VIDEO EQUIPMENT. I WILL USE IT TO TAKE MY BAG AND LAPTOP ABOARD AIRLINES WHEN I FLY.